Smart home technology has been gaining traction, slowly, for about 20 years now. Smart home speakers with artificial intelligence (AI) are the latest piece of the smart home puzzle, and they promise to make home automation a whole lot easier to use. Smart home speakers like the best-selling Amazon Echo and Google Home give you control over a wide range of devices and services from your thermostat to searching the web, to scheduling your day, to ordering a pizza… all controlled using your voice. These small and nondescript WiFi speakers can be placed nearly anywhere. They’ll patiently await your voice command to play music, to open a web page, or to dim the lights in your kitchen – with a few spoken words. Smart home speakers also talk back – to confirm your requests, to walk you through directions, and to remind you of important tasks. At this point, there aren’t very many useful models on the market. But this will change, very soon. Even with the limited choice, you still probably need to read buying guides like this one to help make your decision, because there are so many things you can do with these devices, and there are important differences among the leading models, right now. Before we get to that, however, let’s first explain what a smart home speaker is and how it might fit into a smart home. What is a Smart Home Speaker? Why Do I Need A Smart Home Speaker? While devices such as Google Home and Amazon Echo are not smart home hubs, per se, they can perform many of the same functions. These devices are basically a WiFi-connected speaker with a voice recognition system embedded that can control some of the aspects of your smart home and smart home devices. This mainly includes doing things like dimming lights, or turning a thermostat down. Bottom-line, a smart home speaker is not a hub or a controller. Think of a smart home speaker as just another smart home device that happens to be capable of issuing commands over WiFi to your other devices. Smart home speakers are a new technology that many are trying to wrap their heads around. You probably don’t actually NEED one, yet. That said, getting one will definitely make your life easier at home. This explains why more than 5 million Echos were sold last year, making it Amazon’s best-selling product ever. Hands-free assistance is the major selling point, and it’s one of the best new capabilities you can have in your home. Think about the number of situations where your hands are occupied but you need help – right now. There are plenty of situations where a smart home speaker can help you: from reading you a recipe while you stir, to reporting the score of a game while you are working on a project, to reading your daughter a story at bedtime (yes, really). Using a smart home speaker, you can also control home appliances using your voice. Oh, yeah, in case we forgot: they play music, too. Wireless: 802.11a/b/g/n wi-fi. Bluetooth. MIMO WiFi. Audio: 0-inch tweeter, 2.5 inch woofer. Compatible With: iOS, Fire and Android devices. Smart home device control available through third party apps. Amazon Echo is the best selling smart home speaker today – by far – and for a reason. If you are a major Amazon Prime and Amazon Video/Music user, then look no futher – this is the right one for you. Echo is a portable, 360-degree wireless bluetooth speaker that can stream from online services like Amazon Music. Echo is your personal AI assistant, who can answer questions and schedule your time. Echo is your virtual butler, standing by to perform specific tasks for you – using Alexa Skills (keep reading). The Echo is ready to use, out of the box. It just needs to be connected to your wifi and to an app on your phone or tablet. The speaker is not the greatest in terms of sound quality, but it’s perfectly functional and good enough for its size. Great for when you need some background music, or want to listen to talk radio while doing dishes and such. I’d rate it on-par with most other bluetooth speakers in the same price range. Of course, Echo does a heck of a lot more than other speakers. On the other hand, the voice recognition of the Echo is really impressive, and you don’t have to spend time “teaching” it how to take commands. As long as you are consistent and use exact phrases, Alexa will know what you want to do. The microphone immediately hones-in on your voice when you say “Alexa,” eliminating the need to repeat yourself. Echo can also tell the difference between different people in the home. Impressive – and better than Google Home, in this regard. Alexa is a capable AI assistant right out of the box, able to query the web, play music and check your schedule without complex configuration. When you ask Alexa a question, she performs a search using a proprietary Amazon database or by contacting Amazon if it’s product- or shopping- related. You can do everything from checking the status of an order, to dimming the lights if you have a smart light system. Some people claim that Google Home is better at answering web-search questions, but I found they are both incomplete search solutions, whose accuracy totally depends on the type of query you give them. Amazon’s Alexa app offers access to a massive library of skills you can teach Alexa, such as reading a bedtime story, getting weather updates, or even “inspiring” you with an inspirational quote or two, each morning. There’s a skill for pretty much everything, and it makes using Alexa a lot of fun. Right now there are thousands of skills available, and you can easily customize your Echo to provide you with a broad range of used and assistance that is tailored to your preferences and needs. Admittedly, most of the skills aren’t very good – but you can use Amazon’s excellent user review system to sort the wheat from the chaffe. You can even order contact lenses or buy almost anything using your voice – although right now most people are waiting to see how that turns out. More skills will continue to come out, further enhancing the Echo over time. Alexa Skills is probably the biggest reason to choose an Echo over a Google Home, right now. External speaker controls are limited, but you can mute the microphone if desired. You just twist the top of the speaker to adjust volume. The Echo comes in black and cream colors, giving you a bit of versatility with your decor, but not as much as Google Home. Still, most will be okay with the two colors. Overall, the Echo currently sets the standard for what a smart home speaker should be, and there really isn’t all that much to improve other than adding more skills and perhaps improving the speaker quality somewhere down the line. We think the Echo and Echo Dot are the best home speakers / smart home assistants currently available. The Amazon Echo Dot is a much smaller version of the Echo, and also costs about one third of its larger cousin’s price. It’s a great way to get all the features and capabilities of the Alexa service, but in a much smaller package. This probably explains why it sold out quickly, last Christmas season. 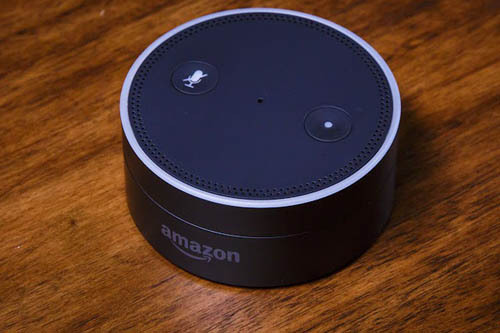 Like the full-sized Echo the Dot has three uses, including audio player, AI assistant, and performing of various Alexa Skills. Amazon Prime and Music support are included, and the Dot is ready to use right out of the box as well. The audio quality is not anything to speak of, but that’s not the point of the Dot. However, unlike the Echo, you can use an auxiliary cable to connect the Dot to an external speaker, which is very handy and completely changes things up. 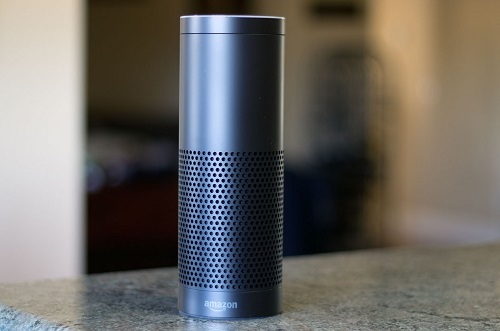 While the Dot doesn’t use the same speaker as the Echo, it still uses the same microphone system, so it’s just as responsive and able to hear and recognize your voice commands even when there’s background noise. Adding skills to Alexa is the same as with the Echo, and all of the skills can be accessed through the app. It also comes in the same two colors and obviously maintains a much less intrusive presence due to its significantly smaller size. The only real drawback, aside from the lack of a real speaker, is the fact that the Dot still has to be plugged in. This is mainly an aesthetic issue however, as most aren’t lacking for electrical outlets in their home, and these speakers tend to be on nightstands, kitchen counters, or somewhere in a living room. If you don’t care about having a portable stereo speaker, but still want all of the same AI and Alexa features as the Echo, the Dot is a great buy, and offers all of these at a much more affordable price. Philips Hue smart bulbs are compatible with Alexa, so you can use Alexa to turn lights on and off, or dim them to your desired level as well. There are other ways to control lights with your speaker, but this is the easiest way that doesn’t involve using other hubs. This skill allows you to control smart Samsung devices without the use of a hub. Alexa communicates directly with Samsung devices anywhere in your home connected to Wi-Fi, from stereos, to televisions, to DVD players. This fun skill gives you six daily Jeopardy questions, all in the form found on the television show. This helpful cooking skill can look up recipes for you, and then guide you through the actual cooking process by asking it questions as you go. You can also use the Chefling app to log all of your grocery purchases, which you can use to ask My Chef to help you choose recipes based off of what you have in the pantry, and even ask when things groceries are expiring. Magic Door is a sort of “choose your own adventure” story that you can guide yourself through basef of your decisions. It’s set in a fantasy world, and includes multiple storylines that are all dependent on that you choose to do. Great way to pass time when you are doing housework. Alexa can be taught to call your favorite ride-sharing service after you’ve entered your information in with the app. After doing so, ordering a ride is as easy as asking Alexa to do so. The Bartender is a drink and cocktail skill that contains over 12,00 different drink recipes. You can ask for recipes based off of certain liquors, or other inclusions as well. Very helpful when entertaining friends, or when looking for your new favorite cocktail for the season. By simply asking Alexa to inspire you, the service will immediately play famous quotes, book excerpts, and famous speeches in a matter of seconds, all set to appropriate music that further enhances the experience. Looking for a personal trainer? Alexa has you covered — at least in the form of a quick workout. The 7 Minute Workout skill walks you through a high-intensity workout, explaining each move and motivating you along the way. Compatible With: Android & iOS devices. Smart home devices include NEST thermostats and many others. The Google Home smart home speaker is more tuned to smart home features and control, and lacks many of the capabilities of the Echo and Dot. Regardless, it can still perform all the basic tasks associated with smart home, and has some better audio qualities as well. 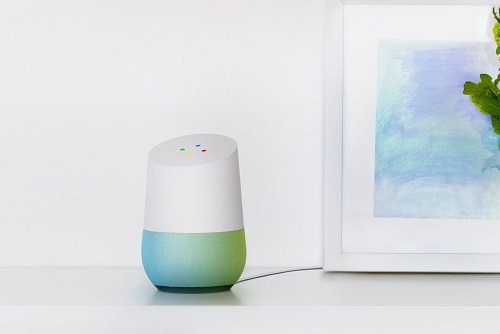 Google Home’s setup is fairly simple, as you just connect it to your wi-fi, and download the control app for your phone or tablet. After that, you’re all set. While you can’t download third party “skills” like with the Echo, Google Home does everything else you’d need it to. Google Home can perform tasks like tracking appointments and other alerts, dim lights, change your thermostat, and all of the other capabilities of a smart home. It can also play music, and has a much better access range for services, as it comes with YouTube Music and Spotify. This helps you take advantage of the richer sound from a better speaker, especially as far as low end is concerned. Things get a little more distorted at a louder volume, so it’s best to put the speaker near a corner if possible so that sound bounces out more at a lower volume. With that said, I’d venture to say that Google home is more geared towards those who will be using their smart home speaker mainly as a music device. You get better sound, and more options for streaming. Google Home is also smaller than the full-size Echo, and many would argue that it looks better. You can even order different colored bases to swap out to better match your surrounding decor. Overall, it’s a little less distracting, so if you’re concerned about aesthetics, you’ll appreciate that. This speaker has fewer microphones than the Echo, but it can still pick up your voice just fine, although you’ll have to sign in a different user if you wish for someone else to give it commands. If you live alone, that’s not a big seal, but bigger households may find that a bit annoying. Still, Google Home is certainly a great option for people who are more concerned with running their smart home features than some of the extras that Alexa provides. If you love Google products, you’ll appreciate Google Home. It’s versatile appearance and better sound are a bonus, and it is cheaper than its Amazon counterpart. Lenovo debuted their new Smart Assistant speaker January 2017 at trade shows, and the speaker is set to makes it debut in May of 2017. The Smart Assistant builds off of the designs of both the Echo and Google Home, and integrates most of the same features. Amazon is allowing other companies to use their Alexa technology as a way to give them more footing and presence in the smart home market. The Smart Assistant utilizes Alexa technology, which means you get all of the same features and capabilities of the Echo. The Smart Assistant aims to be a better version of the Echo, retaining all of the same capabilities, but offering improvements in the areas that the Echo and Google Home fall short in. The main allure of the Smart Assistant is its sound quality. The Echo has passable audio quality, and the Google Home is better, but the Smart Assistant has the best sound of the three. It uses a 10 watt woofer, and a 5 watt tweeter, giving better low end and clearer treble. For $50 more, consumers can upgrade to the Harman Kardon Edition, which offers enhanced sound, along with a 2-inch sound cavity that pushes the speaker quality to the next level. The Smart Assistant also offers a better voice command experience,using 8 microphones instead of the Echo’s 6. This allows users to give the Smart Assistant commands from up to 16 feet away. Testers at the recent trade shows verified this capability, ordering the Smart Assistant to do everything from dim lights, to play music from nearly twice the distance of an Echo. The other main aspect of the Smart Assistant is its abundance of colors, similar to the Google Home. Green, red, and orange are all available trim colors, which all match the slight metallic minimalist style of the Smart Assistant. The Smart Assistant is also in the same price range as the Echo and Google Home, so it will certainly be a huge competitor thanks to its better audio, more colors, and Alexa capabilities. Look for it to become a topseller as soon as it’s available on the market. Network: 802.11ac Wi-Fi with MIMO. Bluetooth 5.0. Audio: High-excursion woofer, custom amplifier, and seven tweeters. Compatible with: iOS devices. Controls HomeKit-compatible smart devices. 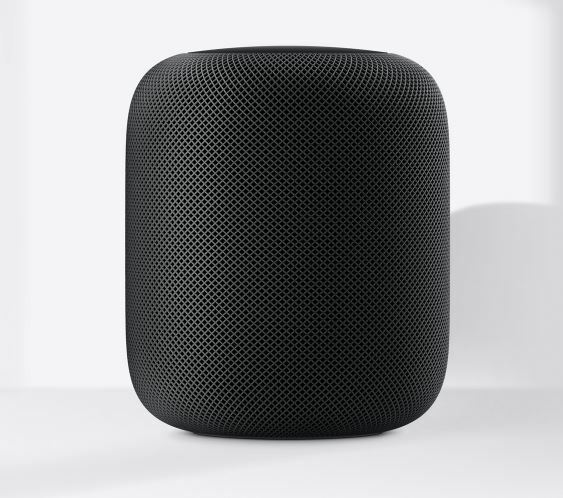 Though late to the party, Apple has – as usual – did a masterful job with their HomePod smart speaker. Among the top smart speakers in the market right now HomePod easily wins the beauty contest. It’s an elegantly designed speaker with a clean look that sticks to Apple’s minimalist ethos. The cylindrical speaker is enveloped in a mesh covering which is available in white and space gray. This is unlike Google Home and Amazon Echo speakers that offer a wider variety of color options. A touch-sensitive panel at the top provides controls for music playback, volume, and Siri activation. Talking about music, this is the best sounding smart speaker you’ll ever listen to. In fact, sound quality – not virtual assistant smarts –is HomePod’s strongest point. When you place it in a room, the speaker uses an array of microphones and algorithms to automatically adjust sound output to the room’s size and dimensions. And boy does it sound good; even better than the Sonos One. Unfortunately, you don’t get many options when it comes to streaming music. The only streaming source is Apple Music. If you want to stream from other sources like Spotify or Pandora you have to stream them on your iPhone and then beam the audio to the HomePod via AirPlay 2. The downside with this workaround is that you have to set it up manually. You can’t just tell Siri to stream TuneIn on your phone and then connect to HomePod. This sort of defeats the whole purpose of having a smart speaker. Hopefully, they’ll add direct support for additional music services shortly. When it comes to virtual assistant smarts, HomePod is hampered by two things. One is the fact that its virtual assistant, Siri, is generally not as good as Google Assistant or Amazon Alexa in many areas. The one area where it outshines them is music recommendation. It quickly learns your tastes and curates its recommendations to fit them. In other areas like answering general questions, giving directions, setting alarms it’s just good enough. Two, it’s compatibility with smart home devices still lags far behind that of Echo and Google Home. Unless your home is full of HomeKit-compatible smart devices, HomePod is not really the best smart home hub. Thankfully, more and smarter devices are joining the HomeKit fold. And even right now, you can still build a decent smart home just with HomeKit-compatible devices. Generally, however, the HomePod is best if you live, breath and click on the Apple ecosystem. Network: Dual-band (2.4 and 5 GHz) Wi-Fi, 802.11 a/b/g/n. Bluetooth with A2DP support. Audio: 2.5” woofer, 0.16” tweeter. Multi-room playback support. Compatible with: Fire OS, Android, and iOS devices. Controls Alexa-compatible smart home devices and appliances. Amazon leads the field of smart speakers with its Amazon Echo lineup starting from the tiny Echo Dot to the screened Echo Show. The Amazon Echo 2 is the follow-up to the original Echo. It’s slightly smaller but otherwise retains most of the design of the first Echo. 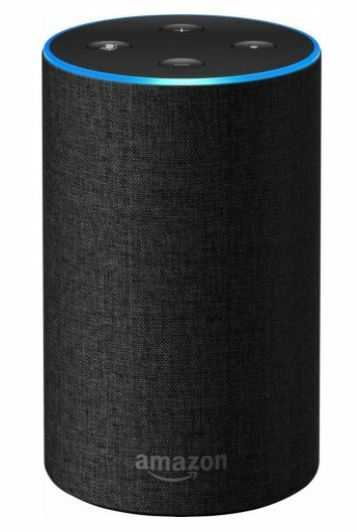 It is not particularly good looking especially compared to HomePod or Sonos One but makes up for it with a range of cover options. These include fabrics in 3 different colors (charcoal, grey, and sandstone) and walnut or oak wood veneers. Unlike the other smart speakers, the Echo doesn’t have a touch-sensitive panel. Instead, you’ll find four buttons for volume, activating Alexa and disabling the microphone. Sound quality has improved from the original Echo, but it’s still no match for what you get with HomePod or Sonos One. But it’s not so bad. It’s surprisingly loud without any distortions. If you are not an audio purist, you’ll find the Echo 2 good enough as your primary music speaker. There are plenty of streaming sources you can command Alexa to connect to including Amazon Music, Spotify, TuneIn, Pandora, and iHeartRadio. You just need to link the service to Alexa in the Alexa smartphone app. After that, you can just use voice commands to access any of them. When it comes to virtual assistant smarts and smart home compatibility, Amazon Echo 2 is undoubtedly the best. Alexa is easy to interact with and can do much more than Siri in HomePod. It can handle all the ordinary tasks (calendar, news, weather, directions, general questions, etc. )and provides extra functionality like free voice and video calls, voice profiles for different users, grouped commands (routines) and multiple commands (follow-up mode). And don’t forget the thousands of Skills that drastically expand Alexa’s functionality. Alexa has the widest smart home compatibility among all other virtual assistants. Virtually any smart device works with Alexa. It’s the best choice if you are serious about building a smart home. Amazon impressed us with the first Echo; they’ve impressed us more with the second generation Echo. It’s the best smart speaker for most people, and at just $100, it’s also one of the cheapest. Audio: Dual 2” speakers with Dolby processing. Multi-room playback support. The Echo speaker is good; the Echo Show is better. Having a screen means you can do so much more than listen to Alexa as she reads out your calendar, the weather or the answer to your question on when the new Avengers movie is coming out. The Echo Show looks more like a block than a modern smart device. The sharp angles and straight edges give it a sort of a retro yet futuristic look. But it doesn’t look so bad and easily disappears among the books and picture frames around the room. The 7-inch screen takes up most of the front side with the remaining section at the bottom occupied by a speaker grille. There are a front camera and mic for video calls. An array of 8 microphones at the top of the Echo Show captures voice commands from wherever you are in the room. The top panel consists of three buttons for volume up/down and turning the mics and camera on/off. The sound and display qualities are great but not mindblowing. It sounds better and louder than other Echo speakers and produces significantly more bass. You can certainly use it as your primary music speaker or radio. The video quality is good but not sharp. With a display resolution of just 1024 x 600, it’s good enough for news briefings, music videos and viewing at the camera feed (yes, you can connect it to your security cam) but you should probably stick to the TV for your movies. So what can you do with Echo Show? Let me get the bad news out of the way first. 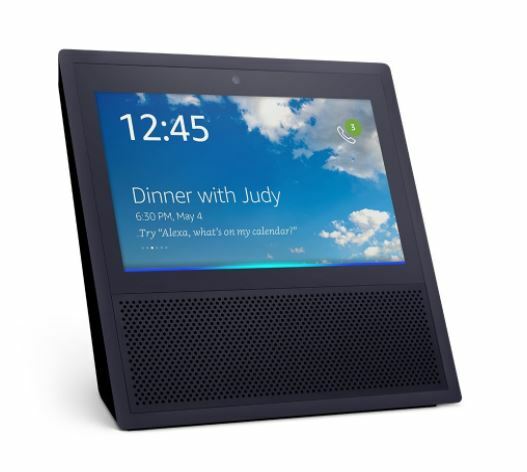 There’s no YouTube on the Echo Show, which is honestly one of the biggest reasons people were buying it.Being able to ask Alexa to show you cooking videos, free music videos and thousands of other clips on YouTube is, or rather was, a big plus. Google and Amazon are bickering over a whole lot of issues, and as a result, they are each denying the other access to each other’s products and services. Google pulled YouTube from Echo Show, Amazon refused to sell Nest products on their website, and consumers continue suffering. But there is still a lot to enjoy in the absence of YouTube. You can watch news briefings, see the weather report, play Amazon music with on-screen lyrics and stream Amazon Prime videos. There is also the drop-in feature which allows you to instantly connect to other Echo Shows. It’s great for connecting with friends or family. As with the Echo speaker, the Echo Show is compatible with and can control numerous smart home devices. You can also access thousands of skills including Uber, AllRecipes, and Jeopardy!. The Echo Show has its share of flaws and at times doesn’t feel as smooth as the other Echo speakers. But it’s a must-have for anyone who wants to take full advantage of what Alexa can do. Even if you already have an Echo speaker, you’ll still appreciate having its screened sibling around. Network: 802.11b/g, 2.4 GHz WiFi. 10/100 Mbps Ethernet port. Audio: 2 Class-D digital amplifiers, one tweeter, and one mid-woofer. Multi-room playback support. You like what you hear about HomePod’s sound quality, but you also love the many features and wide compatibility of Amazon Echo. If you are in such a conundrum, the Sonos One is for you. It is an Alexa-integrated smart speaker with a sound quality rivaling that of HomePod. Like HomePod, Sonos also has a setup process to refine sound output though it requires a bit of work from you. The resulting sound is crisp and quite loud. But it misses out on some of the basses you get with HomePod. 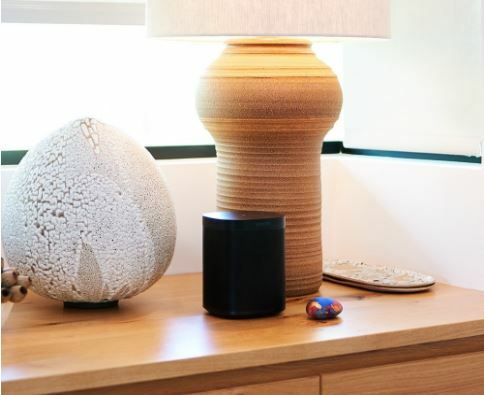 Style-wise, Sonos One follows the same design patterns as HomePod and Amazon Echo. 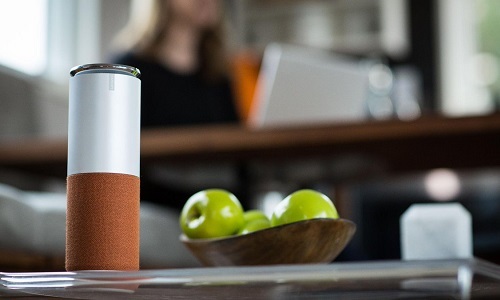 It’s cylindrical with a touch-sensitive panel on top. Here you can control volume, music playback and microphones. There are only two color options: white and black. Inside the minimalist exterior is Alexa and an array of microphones to capture your commands to her. You get the same functionality you would with an Echo…with a few exceptions. Sonos One doesn’t have free calls or the drop-in feature. You also cannot set reminders or listen to audiobooks. But Sonos says some of these features will be available in future updates. Sonos One is the better one when it comes to music. Through voice commands you can access the same music services you would go with an Echo. But switch to the Sonos app, and there are over 50 music and radio services you can link and listen to on your Sonos One speaker. Essentially, Sonos One is the better sounding version of Amazon Echo. Get it if you care a lot about sound quality and don’t mind losing certain Echo features like landline calls. There are currently more than 25,000 Alexa skills available that you can access with any Echo speaker or Alexa-enabled devices such as Sonos One or Ecobee4. Here are the most popular ones in different categories. Find My Phone–A great skill for locating your phone. You can add multiple phone numbers. The phone will ring even if it is on silent. Get Me Up – Have trouble getting up in the morning? Get this Skill. Any.do–One of the best skills for reminders, to-do lists, and calendar. Mastermind–Connects your phone, computer, and TV to Alexa. Functions include sending SMS, launching phone apps, make phone calls, etc. Currently in beta; when you enable it, you’ll be added to a waitlist. Good Morning, Beautiful–The best way to start your day. Uber and Lyft – Hail a ride from your Echo. KAYAK–Find new travel destinations, track flights, plan your travel budget and much more. Perfect frotravelholics. Capital One–Keep abreast of your financials. Check your credit card, checking account balance, unpaid bills and home or auto loan information. Voice Entrepreneur with Ben Smith–Entrepreneur news, business tips, and interviews. TD Ameritrade–Info on US-traded stocks, mutual funds, and all major indices. The Wayne Investigation–Hit the streets of Gotham to find the Wayne killers in this dramatic game. Valossa Movie Finder–Find any movie by name or just by description. Jeopardy!–Play the popular game right from your Echo speaker. Question of the Day–A fun trivia game with questions from different categories. For a music-related trivia game, check out Song Quiz. For the best family-friendly game try Would You Rather for Family. My Chef –grocery shopping lists, recipes, inventory management and other kitchen tasks. You can also try Allrecipes though users say it’s not very smooth. Domino’s – Order a pizza from your Echo. OpenTable–Book a table at a restaurant. 30 Day Pushup Challenge–Become a pushup maniac and get fitter. Five Minute Workout- Core and Cardio–Short and quick workout for those with a busy schedule. Guided Meditation–Guided meditation to relieve stress and help with sleep. The Daily from The New York Times–15-minute news briefing from the NYT, Monday to Friday. Fox News –Latest news from Fox. NPR News Now – 5-minute NPR news briefing updated every hour. ESPN Flash Briefing – Latest sports news from ESPN. Big Sky–Local weather reports and alerts. User Interface – In this case, the interface refers to the apps you use to control and customize aspects the home speaker, as it’s entirely voice commanded. Voice Assistant – Artificial intelligence such as Alexa and Siri aren’t anything new, but they are improving. We look for how quickly the AI responds, what it’s capable of, and how accurate it is. Voice Recognition – Nobody wants to have to repeat themselves to their smart home speaker, so gauging how well it recognizes and acts off your voice is important. Smart Home/iOT Integration – This refers to how well the smart home speaker integrates with smart home features, and how much you can control from it. Built-In Capabilities – Additional services such as Youtube Music, Amazon Prime, and Spotify help improve the speaker’s overall ability and convenience. Third Party Apps – These apps allow you to enhance and expand what the speaker can do, such as ordering food, reading you a story, and setting an alarm. This is done from additional apps that are compatible with the speaker. Search Features – We assess what the speaker can search for from a command, such as asking about a historical event’s date, a television listing, or even a trivia question. Shopping Features – Smart home speakers such as Amazon Echo allow you to order products from Amazon by simply commanding the speaker to do so. Customizing For Your Home – Some home speakers have ways to customize their appearance, mainly with different colors. Network Compatibility – This gauges the speaker’s ability to connect to anything from wifi to Bluetooth. Expandability – Can the speaker be used with other models at the same time? Can it connect to other devices with an auxiliary cord to Bluetooth connection? Security – Smart home speakers need to be able to be muted when you don’t want it picking up your words and prevent intrusion from non-approved users. Setup / Installation – This gauges how easy it is to get the smart home speaker up and running, along with any corresponding apps. Price – How much value are you getting for the money?